Enjoy spectacular views from the 21st floor of this ultra luxurious condo. Be pampered by the renowned Ritz Carlton service. Watch the action on the water, dine al fresco or enjoy spectacular sunsets and beautiful moonlit nights from the 500 sq. ft. terrace. This spacious 2250 sq. ft. condo has been professionally furnished with every amenity to provide maximum comfort. The 2 bedrooms(each with king size bed) + den sleep a total of 5 and 2 additional guests can be comfortably accommodated on the queen size sleeper sofa (with inner spring mattress) in the living room. The unit has 3 bathrooms (2 +powder room) and guests can soothe their aching muscles in the MBR whirlpool tub. Unit has a gourmet kitchen, living room, dining area, laundry room, a large master suite, custom kitchen cabinets, Granite countertops, Bosch appliances, Sub-Zero fridge and 4 HDTV's (including large screen with surround sound and DVD). The Ritz Carlton Residences, Singer Island is a breathtakingly beautiful property with award winning accolades and amazing amenities. It has 2 infinity pools, movie theater for guests private viewing, two social rooms with pool tables, two fitness rooms, concierge service, beautiful beachfront, valet service and reserved covered & secure parking. Activities and Attractions: Seaside relaxation, fabulous restaurants and world class entertainment are just minutes away. The aquamarine waters brought on by the Gulf Stream makes Singer Island a water lover's paradise. Boating enthusiasts will relish Sailfish Marina and Port of Palm Beach, both within a mile. At the condo or at neighboring John D. McCarthur State Park (less than 1 mile away) are an endless array of water sport options from scuba and snorkeling to sailing and fishing. Tennis lovers will enjoy the fabulous new courts installed next door the condo and available free of charge. Enjoy the fun at Lion Country Safari, Palm Beach Zoo or on a Palm Beach Duck Tour. 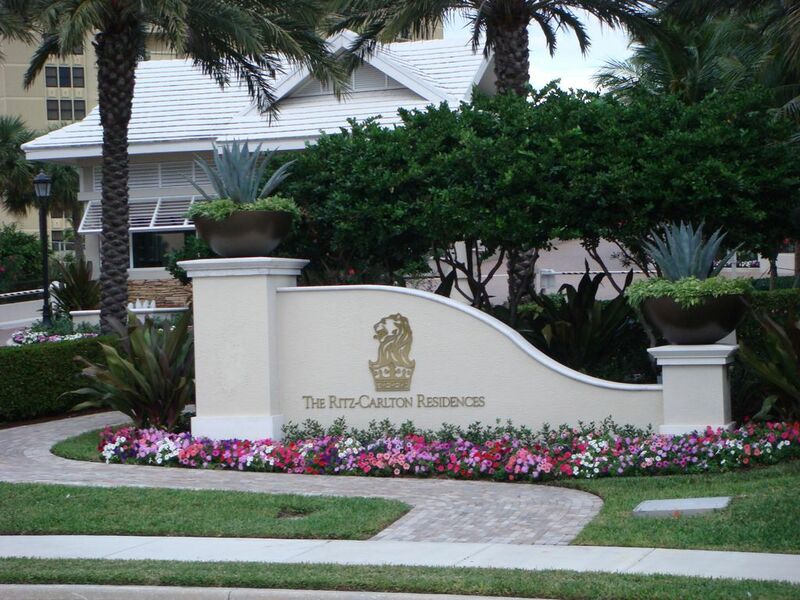 Nearby are several golf courses including the internationally acclaimed PGA National, home of the Honda Classic. 375 ft. of Florida coast's most beautiful beachfront, 2 whirlpool spas with grand views, Tropical landscaped pool deck, Lap pool & free form infinity edge pool set out on the beach, His & hers Sauna, Fitness & Aerobic Center, Theater room, for your private viewing, with cinema style screen, theater seating and entertainment bar. Social entertainment room with full catering facilities, billiard and game tables. Ritz Carlton Concierge and Valet service . Restaurant on site and at the beachfront shopping center 1 block away. Brian’s is wonderful to work with. Very responsive to any queries. Beds very comfortable. Amenities are wonderful. Ongoing construction at the Ritz is a hassle, but hopefully finished soon. Staff at pool, restaurant and concierge couldn’t be nicer or more accommodating. Looking forward to another stay. 1 star reduction because ongoing construction eliminated use of the magnificent balcony and negatively impacted privacy. Once that’s remedied, it’s going to be absolutely perfect again. This was our first visit. It was an excellent high quality condominium. Very well appointed and clean with all one needs for a great and enjoyable vacation. The building exterior is being refreshed so we were unable to use the balcony but Brian was very gracious and accommodating. The entire complex is five star with excellent amenities. The pools ,gym,lobby area all excellent. The Ritz Carlton staff are extraordinary and very customer focused. Brian was extremely responsive and professional. We look forward to our next visit. We highly recommend him. Absolutely spectacular. Brian was so accommodating. Property was amazing. Staff excellent .Condo was well appointed and clean. The staff at this Residence/Resort are truly amazing, and I'm glad to see the very positive rating you gave them. We look forward to your next visit. Great experience ... my family enjoyed a lot ! Thanks for this very kind review. We are delighted that despite the construction, you had such a great time. Look forward to having you again after the construction ends this Christmas.. Thanks for sharing the positive experience you had at our condo. We believe this is an outstanding property, and we're glad to know that despite the fact that there is construction at the property, you had a great time. Hope you'll visit us again.